An Ancient Solar System...: Charon, an ocean world? Pluto's moon Charon may have had an ocean. The New Horizons probe has blown the science world away by revealing Pluto, in all its cold-but-strangely-active strangeness, to us. But Pluto wasn't the only world New Horizons visited that day: The dwarf planet has five moons and the largest of them, Charon, is turning out to be a fascinating little critter in its own right. The little moon sports all kinds of weird features: Craters that have dug into an ammonia rich layer, a strange dark polar cap, and gigantic chasms and tectonic features to point out just a few. Above: A simulated fly by of Charon, showing the vast network of chasms and the dark polar cap. Courtesy of IO9. Now a picture is starting to form for researchers studying the New Horizons data on Charon. The little moon may well once have had a subsurface ocean, like the moons Europa and Enceladus. The evidence comes from the network of fractures and faults that scar the Charon's surface: One possible explanation for them is that as an interior ocean froze it expanded (because water expands when it freezes), and cracked the outer shell of the moon apart. Other lines of evidence point towards an ancient ocean too, like the mysterious ammonia rich crater: Ammonia is a potent antifreeze, and as the ocean froze the ammonia would have become more and more concentrated, as it kept an ever shrinking pool of liquid from freezing. When it finally froze completely the ice that formed would be loaded with ammonia crystals. All of which raises an interesting question: Was it an ocean that could have supported life, out on the edge of interstellar space? The top portion of this image shows part of the feature informally named Serenity Chasma. The lower portion of the image shows color-coded topography of the same scene. 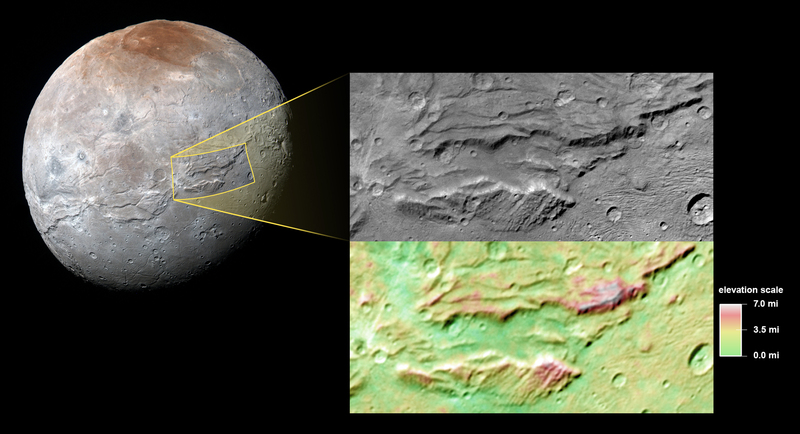 Measurements of the shape of this feature tell scientists that Charon’s water ice layer may have been at least partially liquid in its early history, and has since refrozen. Caption and image courtesy of NASA. Virgin galactic have been busy little beavers, putting together an updated version of their SpaceShip 2 sub-orbital vehicle. Despite the tragedy of a fatal accident during a test flight, the company seems to be hauling itself back. As well as this, they've announced that they will be running orbital flights, for smallsats using their Launcher 1 space rocket. Enjoy!